Celebrate your favorire spot on the map with this bottle opener customized with your coordinates of choice. Whether you enjoy cracking open West Coast IPAs or Brooklyn cream sodas, there's one place they taste best: home. 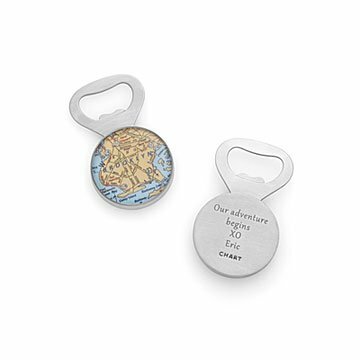 Celebrate your favorite spot on the map with this bottle opener customized with your coordinates of choice. Each map or chart swatch is proudly displayed in resin and mounted in satin-finished, lead-free pewter. It's a functional way to show your hometown—and home bar—pride and makes a creatively personalized housewarming gift. Handmade by Charlotte Guptill in Portland, Maine. Add extra personalization with a custom message engraved on the back of your bottle opener (up to 25 characters). For my husband's boss' retirement, instead of contributing to a gun, we decided to combine this gift with the Lake Topography Art Multi-Layer (16 x 20) piece. Both contain maps of his boss' vacation home. They are both unique to him and remind him of a special place anywhere he goes. We think this is a lovely retirement gift that that sentimental meaning and is classy.